When I’m finished with the Intracoastal Waterway, I just might wander down the Mississippi. By happy coincidence, today’s online edition of the New York Times published an account of a father and son kayak trip down a portion of the Mississippi River, starting just below St. Louis. They traveled for about 150 miles and camped most nights along the banks of the river. The online story includes a slide show and links to various parks and maps. A few weeks ago, while sitting in the nearly completed cockpit of my Stevenson Pocket Cruiser and swiveling my newly cut tiller, I was struck by the sudden realization that I can see the finish line. It’s still far away, but it’s real and for the first time I know I will make it. With the hull and cabin completed I am now building the rudder, hatch, and other details that make the boat look even more like a boat. A great deal of work remains, of course, but the list is not impossibly long. As my “to do” list shrinks, my confidence grows. It’s time to seriously research my long planned cruise. As I mentioned last month, my interest in boat building was inspired by fantasies of adventures in the South Seas. But I reigned in this unrealistic dream and I settled for a small boat and a vague idea of exploring protected waters closer to home. However, my preoccupation with building kept me from investigating my options. But as my boat takes shape, it’s time to plan my itinerary. As a resident of southeastern Pennsylvania, the logical place to start is the Chesapeake Bay, and that will almost certainly be my “home port.” Truthfully, the Bay’s countless inlets and islands could occupy me for years. But why stop there? For inland sailors, the Chesapeake is only one part of an interconnected network of canals, bays, lakes and rivers that encircle the eastern half of North America. 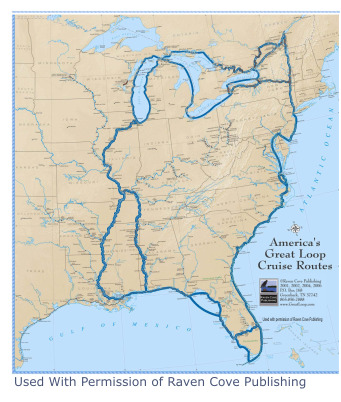 Collectively they form a 6,000 mile ribbon of water known as the Great Loop. The idea of dropping my boat in the water and ending up in, say, the Everglades or the Great Lakes is almost irresistible. But it’s also true that I probably won’t undertake the whole trip—at least not for a while. So with a small boat and limited time (let’s say a month or two), what portions of the Loop are most worth exploring? I began by investigating the most famous (and probably most traveled) part of this inland passage—the Intracoastal Waterway. Following a series of canals and bays, it provides a nautical Interstate 95 linking New York to Florida. You can read the rest on Duckworks. Do you have any first hand experience with the ICW or other portions of the Great Loop? If so, let me know. I’d love to feature some guest columns from experienced sailors. You are currently browsing the Build a Boat, Sail Away blog archives for January, 2010.